A science fiction adventure, Journey To The Centre Of The Earth is a family-friendly descent into a strange world. The science is suspect and the special effects dated, but the film nevertheless delivers easy entertainment. Edinburgh, 1880. Celebrated geology Professor Sir Oliver Lindenbrook (James Mason) researches a piece of rock gifted to him by his student Alec McEwan (Pat Boone), and finds a hidden message from legendary explorer Arne Saknussemm who attempted to reach the centre of the Earth 300 years ago. McEwan interrupts a fledgling romance with Lindenbrook's niece Jenny (Diane Baker) and joins Sir Oliver on a hastily arranged expedition to retrace Saknussemm's path through an Icelandic volcano. Once in Iceland they tangle with rival Swedish Professor Göteborg (Ivan Triesault), who is promptly poisoned to death by a mysterious evil doer. 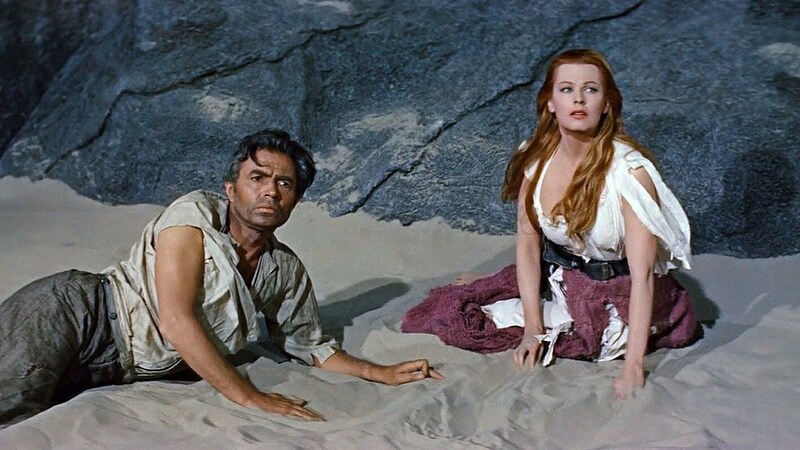 His widow Carla (Arlene Dahl) joins the expedition, as does local man Hans (Peter Ronson). Sir Oliver and his team descend into the volcano and discover an amazing world of caves, salt deposits, crystals, underground oceans, tree-sized mushrooms and massive reptilian creatures, but the main threat comes from Count Saknussemm (Thayer David), who wants to protect his ancestor's legacy. An adaptation of the classic Jules Verne novel directed by Henry Levin, Journey To The Centre Of Earth is an efficient, almost mechanical, recreation of a fantastical expedition. Focussing much more on a succession of impressive (for the era) sets rather than character nuance and interaction, the film defaults to a series of set-pieces. Lindenbrook's group sequentially encounter and overcome one obstacle at a time with barely a pause for reflection, the challenges covering the animal, mineral and vegetable kingdoms. The film is undoubtedly enjoyable for its vivid colours, outlandish sets, and earnest "what next" construction, but singularly lacks intensity and tension. Any sense of real danger, drama or conflict is easily swept away by the pedestrian execution, remarkably clean clothes and staged encounters, Levin never coming close to injecting anything that resembles emotion or genuine scientific discovery. Questions as to why gigantic reptiles live in the bowels of the earth, how oversized mushrooms grow down there, or what brought an ocean and a long-lost city to exist miles below the surface are barely even asked, let alone answered. The character dynamics are equally superficial. There is some fun to be had in the banter between Carla and Sir Oliver, and her insistence on joining the adventure and proving her value is a welcome early feminist flagpost. But otherwise this team of intrepid explorers mainly exists to stop and stare in wonderment rather than conduct any actual science. The performances match the tone, Mason working up a theatrical sweat as the group's leader while Pat Boone awaits the next opportunity to take off his shirt and warble a song for his real fans.